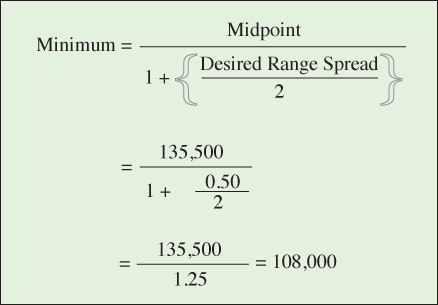 Determining the minimum and maximum when only the midpoint is known . . . When using survey data to determine the salary range for a position, you could use the 10th 50th and 90th percentiles as your minimum, midpoint, and maximum for the range. One of the problems with doing that, though, is that those points tend to fluctuate with the survey data so that you never really know what your range spread is from position to position. There is a simple method for determining the min, mid, and max of your salary range when only the midpoint of the survey data is known. First, you have to decide whether you want to use the 50th percentile as your midpoint or use the mean of the salary data for the demographic elements you’ve selected. For this example, let’s use the mean shown below. Image from Compensation.BLR.com Salary Finder. The next decision you need to make is the range spread. Do you want it to be 25%, 50%, 75%, or even more? For this example, let’s use 50% as our range spread. In this case, the midpoint of our rage is $135,500 (rounding is okay). It’s easy on the eyes which makes it far more pleasant for me to come here and visit more regularly.